I've seen the question of how to set up a convention booth crop up repeatedly in recent weeks (probably has something to do with con season getting underway) so I thought I'd throw out my thoughts on the subject. Speaking, of course, as someone who's never actually had a convention booth, but a fan with degrees in both graphics and marketing. Let's start with this shot of Artists' Alley that I took over the weekend... This is what the average con-goes sees as they're walking down the aisles. Mostly a lot of people with a bit of signage popping up over top. But look just above that blurry guy in front. You see a sign for G.W. Fisher, right? His booth is actually one aisle over with his sign reaching maybe 10-12 feet in the air. The booth right there in THIS aisle has an overhead sign, too, but it's maybe only 7-8 feet high... and you can't see it because of the person in front of the camera. You know what banners those are if you've been to a convention of any sort recently. It's a piece of vinyl that's rolled up and stretched between two ends of a retractable pole. They're attractive, easy to transport, quick to set up, and reasonable durable. They're also not really expensive, even with the custom graphics on them. Sounds like a great deal all around, and so a lot of people get them for their booths. 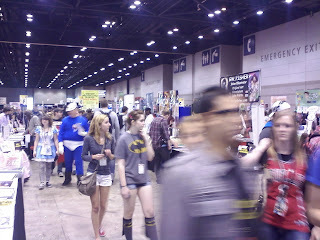 But they don't have much practical visibility in a crowded Artists' Alley. You need a sign that not only rises above the crowd, but one that rises enough above the crowd trying to look at it at an angle over the heads of other people in the crowd. In other words, your sign needs to start at 7-8 feet off the ground and go up from there. Don't look at what you have now from across the room to see if it works; look at it from across a crowded room. I want to give a second shout-out to Fisher here. He's in the next aisle over. We're looking at the back of his booth. You can see his name and examples of his art even if you're in a different aisle than he is. Now, this of course, won't do any good if you're up against a wall or back to back with a booth that has a full background display of some sort, but if neither of those are present, that would give you a huge advantage in terms of name recognition. Next, make sure your name and/or book is readily visible IN MULTIPLE PLACES. That cool, super-tall banner is great from down the aisle, but much more difficult to read once someone is standing a few feet from your table. Your name should be ON the table for people looking at whatever merchandise you have and again at about eye level for people talking to you. (If you're seated, a visitor's eye level would be just above your head. It you're standing, it'd be just behind you and, since you're standing, you're likely to move around a bit anyway.) Personally, I don't think it's a bad idea to have your name yet again on the front of your booth for people with a lower gaze. Also, make sure you have some kind of take-away with your name and contact info on it. Business card, bookmark, pins, whatever. 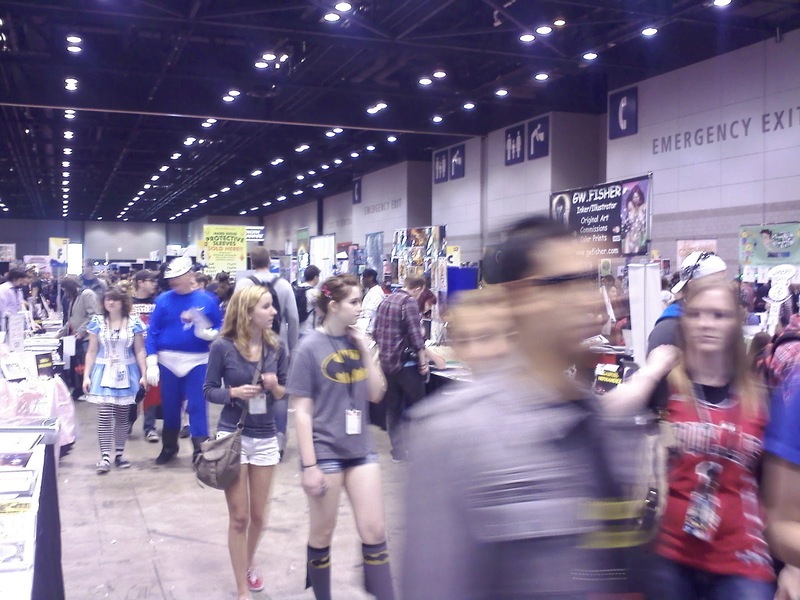 A convention is a crazy, nutso place with lots of opportunity for sensory overload. Even if someone really likes your work and is just going to be a minute as they walk back to the ATM for some cash, there are literally thousands of things that might keep them from coming back. They might still like your stuff, but the sights and sounds can be overwhelming and they could well forget where your booth is. Or your name. Or the name of your book. Or your website address. If you let them walk away with something with your name on it, they at least have a reminder of you and how to check out your stuff again later after they recuperate. Yes, cards and bookmarks cost money, but so did the booth. Literally, these are the costs of doing business. Have something for them to remember you by. For something more in-depth about the table top, check out this episode of Strip Search if you haven't already. The challenge for the contestants is to set up a convention booth, and all of them have to use the same materials. There's some obvious limits in terms of what they can do with signage and pricing and whatnot, but you can compare/contrast what each one does more directly. There are some EXCELLENT points brought up, and this is well worth watching just for them. Something else not discussed in the video, but might be worth trying. Keeping some space on the table open FOR YOUR CUSTOMERS. They're walking around the con buying stuff, from heavy statues to sodas; they're often not going to be able to look at your stuff AND hold whatever it is they're holding. They're going to need to set it down, and sometimes it's not advisable to set it on the ground (in the cases of, say, food or original art). Without someplace on the table for them to set things down, that means it's going ON your stuff. Maybe not so bad if they're setting down a quick sketch somebody made for them, maybe a big problem if it's a greasy hot dog with lots of mustard and relish. I keep a scattering of my tiny paintings on my table and SO MANY people set their bag on top of them. 4-5 are ruined a day because of this. This isn't intended to be an exhaustive list of dos and don'ts for your booth, but it's meant to get you thinking about your booth in ways that I don't see many people actually thinking about. I know you just wanted to get into comics to actually make comics, but this marketing stuff is part of the gig, too! Make your booth work for you, not against you! UPDATE: Just as I was finishing some notes here, I see that Gene Ha just posted many tips of his own!